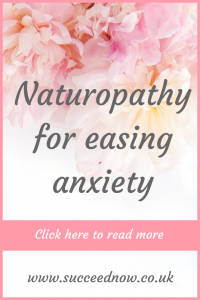 Let my start by telling you a little bit about naturopathy, as unfortunately most people aren’t familiar with this form of complementary medicine. Naturopathy is a holistic approach to western medicine: we listen to your symptoms, we look at your blood work, and we use the same terminology as your GP would. Your GP will ask you WHAT your symptoms are, give them a name – a diagnosis, and then offer a treatment (usually, a pill to treat these symptoms); a naturopath will go one step further by asking WHY. I’ll give you an example: your head is pounding, and you are feeling sensitive to light. You may head off to your GP, who will listen to your complaints, tell you that what you’ve got is a migraine, and offer you a painkiller to treat the problem. As a naturopath, I will use the diagnosis of migraine that you were given, but I will try and learn, together with you, why you’re suffering from it (sleep deprivation, stress, hormonal imbalance, food sensitivity, dehydration, excessive caffeine intake, etc.). We will then work on treating the root cause of the problem, in order to prevent recurrence. A naturopath will normally treat these issues with a personally-tailored solution including a dietary intervention, lifestyle adjustments, herbal medicine, supplements, Bach Flower Remedies, and other natural interventions – according to your needs. 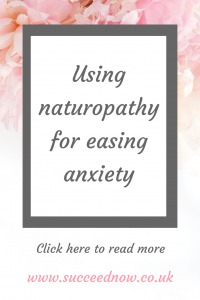 When it comes to anxiety, it can be said that, broadly speaking, the purpose of a naturopathic intervention would be to prevent future panic attacks, find and address the root cause of the anxiety, and offer tools to better manage anxiety in the future. A randomised controlled study compared the effectiveness of naturopathic care to psychotherapy for symptoms of anxiety. The naturopathic intervention included dietary counselling, deep breathing exercises, a multi-vitamin and a preparation made from a herb called Withania somnifera (known as ashwaganda). They found that after 8 weeks, the anxiety scores of people in the naturopathic care group decreased by 56.5% (compared with 30.5% in the conventional treatment group). They also experienced added improvements in mental health, concentration, fatigue social functioning, vitality, and overall quality of life. As I said, from the naturopathic perspective there isn’t really a “one size fits all”. 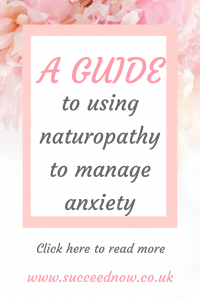 There can be many different causes for anxiety, including stress, genetic disposition, hormonal imbalance, trauma, personality, nutritional deficiencies, critical illnesses, and so on, which should be treated on an individual basis. Having said that, there are certainly a few things that will help most people (as you can see from the study above): maintaining a well-balanced diet that includes enough B vitamins, omega 3 fatty acids, and fresh whole foods can improve the function of the nervous system, and help the body manage stresses – which may, over time, become a trigger for anxiety. Eating small meals at regular times of day, and fairly often, can help regulate blood sugar levels, easing anxiety. Of course, identifying and avoiding foods which worsen your anxiety, such as alcohol, caffeine, simple carbohydrates, and processed foods, is also critical. B vitamins, such as whole grains (quinoa, barley, rice, oats, etc.). legumes (beans, peas and lentils), vegetables (mostly dark leafy greens, sprouts and root vegetables), and fruit. Magnesium, such as dark leafy greens, legumes, whole grains and seeds. Neurotransmitters, which can act as a natural source of serotonin, tryptophan and melatonin, such fruits, whole grains, seeds (pumpkin, sesame, sunflower etc. ), fish, and turkey. Omega 3 fatty acids, such as fish, flaxseeds, chia seeds, nuts, olive oil, etc. Probiotics, such as pickles, sauerkraut, fermented foods, and kefir or kombucha. Antioxidants, vitamins and minerals, such as fruit and vegetables. Make sure you’re drinking enough water, as dehydration (even if mild) can negatively affect your mood. *Obviously, if you have a sensitivity to any of the foods I have listed above you should avoid them. Many of my patients find that having a list of easy and simple tasks that they complete on a daily basis helps create a sense of capability and control. This helps strengthen them for any other activity they find difficult. When it comes to herbal medicine, you should consult a naturopath who can help identify the right treatment for you. Please be especially careful if you’re taking medication, as there may be interactions between herbal medicine and medication. However, there are mild forms of herbal medicine that can help most people, such as herbal teas. These are unlikely to cause side effects but are still powerful enough to help. Herbal teas that can reduce anxiety include chamomile, linden, lemon balm, verbena, lavender, and passionflower. The same thing applies to supplements. I myself believe that you shouldn’t take supplements unless you need them, and a well-balanced diet should provide you with all you need. At the same time, I will say that there are a few common nutritional deficiencies that may worsen anxiety. You could consider trying and these include B vitamins, omega 3s, and magnesium. Many people may also find a probiotic supplement very helpful. 07:00 Get up (no hitting the snooze button! ), 10 minutes of meditation. 07:30 Herbal medicine formula. Breakfast: chamomile tea, muesli with fresh berries, large glass of water. Remember to take blue-light blocking glasses to office! 13:30 Lunch: Salad with chicken /quinoa –mixed seeds topping, large glass of water. 16:00 Snack time: banana and cup of verbena tea with biscuit (home-made! ), large glass of water. Mood Mint app. 19:30 Herbal medicine formula. Dinner: whole wheat pasta with lentil ragout / large bowl of soup with traditional rye bread / fish with cooked vegetables. Large glass of water. 20:30 Cup of lemon balm tea, tapioca dessert with tart cherries or kiwi. Watch something happy on television. 22:00 Turn off the internet on your phone. This patient, in addition to anxiety, struggled with depression and had rather a gloomy outlook. So it was important to incorporate things like time outside, mild exercise, and using an app that helps with cognitive bias modification, such as Mood Mint. He also found his anxiety was making it difficult for him to go to sleep. This is why I suggested using blue light blocking glasses at work, and added the tart cherries/kiwi in the evening, and why I enforced a no mobile internet rule after 22:00. He also has a herbal medicine formula that was customised to his needs. You don’t need me to repeat that what is right for him won’t be right for everyone. I wanted you to see an example of a daily routine that isn’t too difficult to follow, and includes all the nutrients to help support him in his goals. Anxiety can feel all-consuming on some days. It’s not easy to go from 0-100 when it comes to creating a healthy lifestyle. Just today I had to talk to a lovely long-term patient of mine, and remind her that when it’s really tough you just pick one thing. One thing that you’re going to do today that will help. Tomorrow maybe you’ll feel well enough to do two, but today you’re going to do one thing. Finding the right way for you will likely include some trial and error. My greatest advice is to avoid all the odd and contradicting advice on the internet. There is no one pill that will cure you. There is a healthy lifestyle that you create for yourself. By finding all the things that work for you and weaving them together to create your best life, and constantly working to push your limits and expand your definition of what your best life is. Try adding good habits one at a time, watch their effect, and then repeat. Try reducing the less-helpful habits one at a time, watch the effect this has, and then repeat. Talk to a naturopath if you need help with this, and find one who has the same outlook as you do. I’m not the right one for everyone, I believe in moderation and some people need the extreme approach. Believe that you can create a positive, long-lasting change in your life, and you will. Maya is a naturopath, life coach, and health qi-gong instructor. Maya graduated as a naturopath over 6 years ago. She has since been relentless in advancing her knowledge of complementary medicine. Specialising in treating children, and in treating heart disease, metabolic syndrome and other chronic conditions. She is currently finishing her studies towards an MSc in advanced complementary medicine in the Northern College of Acupuncture in York. Writing her dissertation on the evidence base for naturopathic interventions in the management of non-alcoholic fatty liver disease. Maya currently works in an integrative medicine clinic. In her own private practice, and sees patients from all around the world through Skype consultations. She also co-hosts The Action For Wellness podcast which is available through iTunes, stitcher and spreaker.